Does a Red Panda Hibernate or Migrate in Cold Weather? 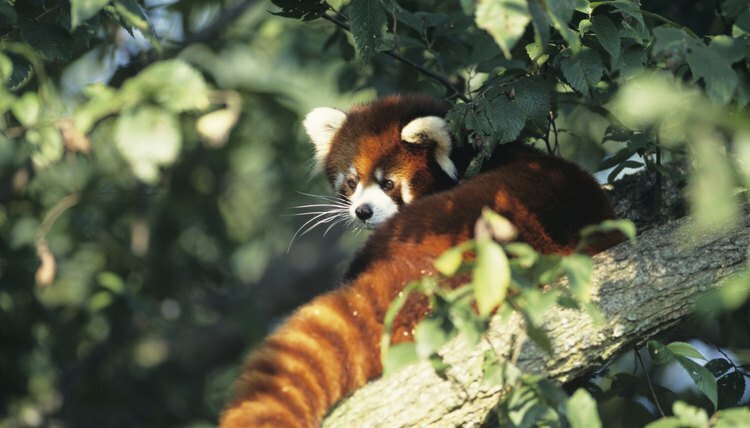 Red pandas live in temperate forests in Bhutan, China, India, Myanmar and Nepal. They’re better adapted to cold than to heat, and they spend winters as well as summers in their home territories. They don’t hibernate, but they do rely on their heavy fur and bushy tails to keep them warm during cold spells. A mountain species, the red panda usually lives at elevations between 5,000 feet and 13,000 feet. Red pandas are comfortable in temperatures between 35 and 75 degrees Fahrenheit, and they suffer if the mercury climbs higher than 75 degrees. The thermostat rarely drops below freezing in their native climate. For captive pandas in areas where temperatures fall around 20 degrees Fahrenheit, the Association of Zoos and Aquariums recommends providing heated shelters. Red pandas’ double coat of fur provides insulation against cold temperatures. A thick undercoat is topped with a layer of heavy hair over a panda's entire body, helping prevent internal heat from escaping. The fur even covers the bottoms of their feet so they can walk in snow without becoming cold. When they perch in trees -- their preferred location for sleeping and resting -- they can wrap their bushy tails around themselves for extra warmth. Winter temperatures and shortened days affect the red panda diet. With fewer foods available during cold months, they eat bamboo almost exclusively and spend up to 13 hours foraging every day. During the summer, they fill up on nutrients from other foods, such as bark, berries, fruit, leaves and insects. Because of their limited winter diet, red pandas have slow metabolisms -- in fact only slightly higher than the metabolism of sloths. During especially cold spells, they can lower their metabolic rates further while keeping their internal temperatures consistent. Like their other adaptations, red pandas’ low energy output helps them survive winters without needing to hibernate or migrate.